This book is FAT. Yep, a epic hefty paperweight of Italian cookbook. I felt cultured from Chapter 1 – Sauces. I was in the mood for a new spaghetti and meatballs. I have many variations but this one is my new favorite. In the book, it’s Rigatoni with Meatballs… this sauce is delicious!! My version of this recipe is below – a meaty, tangy and fragrant Italian dinner straight from The Silver Spoon. Combine the ground meat, egg, parsley and garlic in a bowl. Then add salt and pepper. Shape the mixture into small meatballs, dust with flour and set aside. Heat the oil in a large deep pan, add the onion, celery, carrot, and rosemary and cook over low heat, stirring occasionally, for 5 minutes, then add the meatballs and increase the heat to medium. Cook until the meatballs are lightly browned all over, then add the crushed tomatoes. Lower the heat, cover and simmer, stirring occasionally for about 40 minutes. 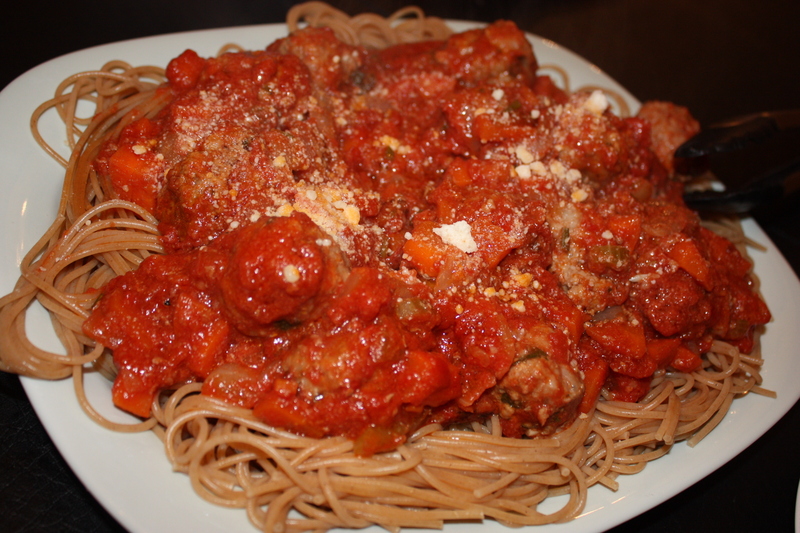 Cook the spaghetti in a pot of salted boiling water to al dente, drain and serve meatballs with sauce over the pasta. Dress with freshly grated parmesan cheese and enjoy! I also served this with garlic bread and it was super delicious!